Via Reddit, who lost its wallet at the intersection of clumsy and drunk. Okay, I get it. You mean I, some anonymous middle-aged working-class guy, I am a ‘nerd’. Oh, but wait a second… I didn’t installed Kubuntu. I bought a computer with Kubuntu on it… All I had to do is to open it, and guess what? It worked. I never got any problem of any sort, and I’m using it every day since june 2008. Everything’s just far better than it ever was with Windows: like when I used Windows, with Kubuntu I can surf on the internet, read my emails, listen to music, watch my dvds, write my letters, view my photos… Oh, and now using Kubuntu, I don’t have virus issues, «driver» issues (why the hell does my computer need a «driver», anyway? I got a laptop, not a limo), random crashes, slowness… It just _works_ great. So here’s my friendly advice: why don’t you cut the crap and, I don’t know, maybe look out by yourself what Linux is really like today? Reading this note, I’m quite sure you’d be surprised. 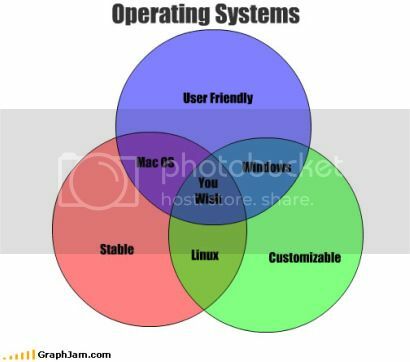 Your diagram features a nice ‘You wish’… I wouldn’t be astonished to know that what you wish is actually… Linux.